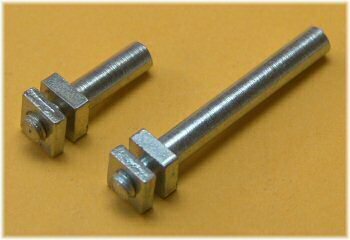 The threaded pin is a convenient way of attaching a short stub axle to a Meccano part, and has a whole range of uses. Part 115 first appears in the 1920 manual, and was included in outfits as low as number 2. 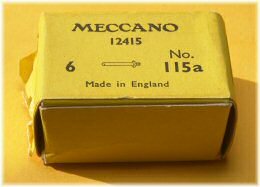 In 1962, along with a whole range of changes to the then light red/green Meccano outfits, the new longer threaded pin part 115a was added to the system. With a pin just over 1'' long, pulleys or gears could now be secured to the pin with an additional collar on top. There are many other uses, of course. A number of minor improvements have been made to the threaded pin through its lifetime. The first ones had a round shoulder, replaced by a square one in around 1927 (first and second examples in the picture to the right). 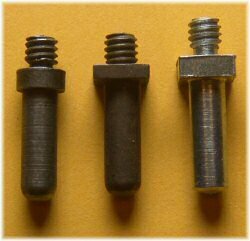 Post-war, the end of the threaded pin changed from a fully-rounded to a truncated shape, as per the one on the far right of this picture. The post-war truncated ended threaded pin is the most common, initially nickel plated and then zinc plated from 1966 when the finishes of these small parts changed. In around 1974, along with the change of part 37a to part 37c (the hex nut), the square shoulder of the threaded pin changed to a hexagonal one. This is quite a rare part, as very soon afterwards the shoulder was removed altogether. The middle example in this picture shows the early thread-only version. These are also not very common, and soon changed to the example far-right with slightly more thread. The length of the thread increases from about ¼'' to about 5/16''. Both of these variations were of course much cheaper to manufacture than the earlier shouldered pins. 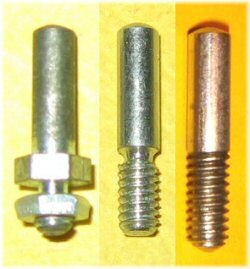 The 1978/79 matt brass threaded pin is the same version as the right-hand example in this picture. The photo on the left shows that the same thing happened to part 115a too, from square shoulder to hex shoulder, and then the two different lengths of threading to the same pin. The threaded section on the long threaded pin increases from ¼'' to about 3/8''. I'm going to need help with the final versions of all these - matt brass, odd shoulders and so on... watch this space, or please email me with what you know! After Binns Road, the slightly different French parts take over as the 'standard' again – the standard threaded pin regains its pre-war rounded end, and the long threaded pin reverts to the shorter threaded version. Odd blackened steel 115a from late 70's? Where from? The main problem I have so far is that I've found a blackened steel 115a in the shoulderless long thread variety – like 115a.zn3 below. I have a photo, but have no idea where this could have come from. There isn't one in the Combat or Army outfits. Can anyone explain it? Ed sent us a picture of an intermediate-sized threaded pin, which is correctly formed at both ends but more than likely just a production hiccup. He does, however, say that it's a very useful size, and it's possible it was a model room special. 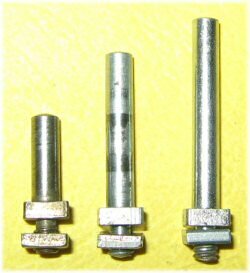 William Irwin also has a small number of late-70's threaded pins (see below) that are too long, about 13/16'' long overall rather than the standard ¾'' of the matt brass one shown for comparison. 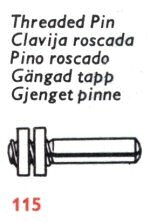 One oddity, though, is the picture of the threaded pin in the 1962-69 Meccano manuals. For example, the part from the red manual 4/5/6 dated January 1964 is shown to the left. Part 115 is clearly shown as being the later (1975-on) type, with no shoulder but two separate nuts. We know that the fixed shoulder changed to hex in 1974, which would surely preclude this part existing until after that date. Is this artistic licence in the manuals? It seems very likely, as there doesn't appear to be any evidence of this part. Harry Fell's Datafiles 3 also lists the threaded pin with no shoulder from 1962, almost certainly from the same source. Ironic, then, that the draughtsman thought of this cost-saving measure but it wasn't put into production for a dozen years or more. This box of long threaded pins obviously dates from 1962 or later (the introduction of the part), but probably not long after 1964 when the new owners of Meccano started to use the blue stickers on the small parts boxes. Note: All threaded pins were supplied with a nut (or two, in the case of the late 70's onwards parts without an integral shoulder). The photographs above show the parts without this nut for clarity. ¹ Included in the 1980 Action Pack outfits 7801 (Stellar Missile) and 7953 (Container Truck), but not supplied with pre-1979 outfit 10's as far as we know. Just bought the Meccano 50 Model. Only to find the machine on the front page cant be built as its missing part/s 115a. Geoff Wright of MW Models informs me that he was responsible for persuading Meccano Ltd. to drop the shouldered Pins in favour of the plain threaded ones. Meccano then made the mistake of manufacturing them from Screwed Rod stock, which is undersize in diameter. The msitake was fairly quickly rectified but undersize brass 115's and 115a's do turn up. With regard to the comment concerning possible "artistic licence" and the 1960s manual parts pictures, it may be the case that the reason why the threaded pin appears not to have a shoulder is because, unless I am mistaken, the same general image is used for part 115 as is used for part 147b. The two pictures are respectively modified at the head end, but that seems to be the only difference. The image of 115a, by the way, in the 7/8 manual is not shared with 147b and, predictably, does not show a lack of shoulder.